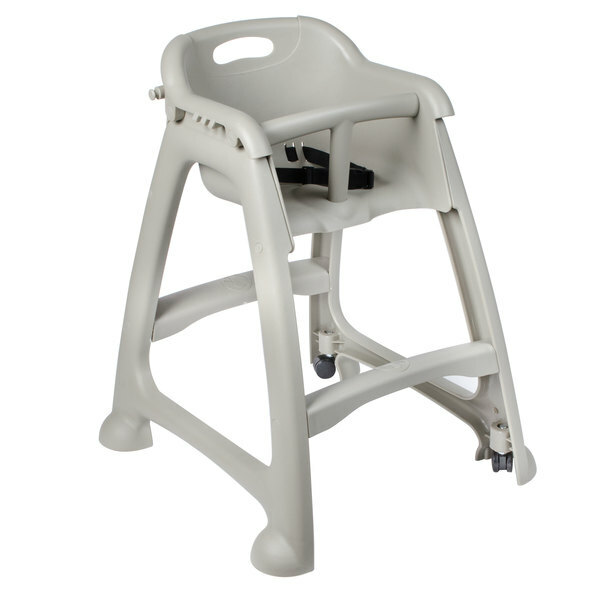 This high chair has a classic design, complete with a seat belt in order to safely and comfortably accommodate children during a dining experience, while spring loaded wheels allow for easy mobility and lock in place when a child is seated. The average child requiring a chair like this one weighs between 10-20 lb. The suggested weight capacity for this chair is 15-35 lb. Featuring its own tray with a cup holder, a child can have its meal placed directly in front of them so they don't have to reach onto the dining table, making this high chair an ideal choice for multiple dining environments. From fast-food and casual dining to family diners and cafeterias, your guests will have peace of mind knowing their child is safe. The tray easily snaps on and off for quick cleaning, and when the tray is not attached, this chair is stackable for space-efficient storage.